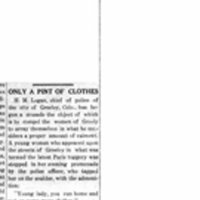 A newspaper article from the Graham Guardian, August 1, 1913, which describes a police chief in Greeley, Colorado who asks a woman he feels is underdressed to "put on some more clothes," because "You would be more modest in silk tights. Run along now. We don't want any 'September Morns' in Greeley." "Young lady, you run home and put on some more clothes." "Sir, this is the very latest gown obtainable," the fair one indignantly replied. "That may be true," answered the doughty chief of police, "but there is not enough of it." "It reaches to my ankles, as you can plainly see," persisted the argumentative fair one. "Yes, but there is nothing under it. You would be more modest in silk tights. Run along now. We don't want any 'September Morns' in Greeley." Chief Logan saw that she obeyed, and said that in the future he proposes that Greeley women wear sufficient clothing to minimize their fine points. "It's getting worse and worse," he said indignantly. "I'm not boosting any lingerie manufacturers, either but they can't walk these streets tightly wrapped in silk handerchief [sic] and a haughty stare. Some of them don't even wear a corset because it takes up too much room, while the large ones, who use a windless to lace and wind themselves into the stright up-and-down stays, bulge out at the top and bottom like a chariatte russe running over. I'll bet a horse chestnut that the girl I sent home didn't have a pint of clothes. Yes, sir, a pint. That's the way to measure them. You could have wadded that latest creation into a pint or half-pint measure. Besides that, you could see through it. I know because—well, I know." This image was made available by the Chronicling America project of the Library of Congress. The original newspaper story is, because of age, in the public domain. This image is made available by the Library of Congress's Chronicling America project. Graham Guardian, August 1, 1913, page 2. Graham Guardian (Safford, Arizona), "Only a Pint of Clothes," in September Morn Archive, Item #67, http://septembermorn.org/items/show/67 (accessed April 21, 2019).